Set up an auto-forwarding rule in your Gmail account to the Global Blacklist due to Amazon's opt-out policy. ⏳ It takes about 10 minutes to complete this step. ❓ Why should I complete this step? Amazon allows shoppers to opt out of unsolicited emails sent from third-party sellers. If you send a message to an opted-out shopper, you will receive a "bounced" email notification saying that the buyer has opted out of receiving unsolicited messages. While these opt-out notifications may feel discouraging, Feedback Genius sellers can use them to add to the Global Blacklist. The Global Blacklist will prevent yourself and anyone else using Feedback Genius from messaging that opted-out buyer again. Follow the instructions below to get those opt-out notifications out of your inbox and feeding into the Global Blacklist! Note: (3:01 in the video) In addition to clicking the box to "Forward" the email to the Global Blacklist, you can click the "Delete it" or "Skip the inbox" checkbox to stop receiving the notifications in your Gmail inbox. Prefer written instructions? Keep reading! Step 1: Go to the Blacklist page in your Feedback Genius account. Login to your Feedback Genius account, click on your email address in the upper right-hand corner, and select Blacklist. Step 2: Click the question mark “?” to see your unique blacklist email address. Step 3: Copy your unique blacklist email address from Feedback Genius and open the Gmail account where you receive opt-out notifications from Amazon. 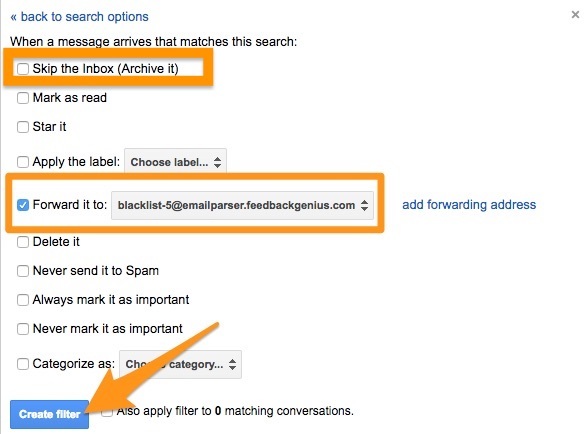 Step 4: Within Gmail, go to the Forwarding and POP/IMAP option within the settings and add your unique Feedback Genius email address to the forwarding option. 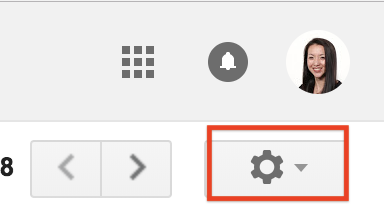 Click on the "Settings" gear icon in the right hand corner of your Gmail account. Click on the "Forwarding and POP/IMAP" tab, then click on "Add a forwarding address"
Step 5: Paste your unique blacklist email address into the space provided and click Next. Step 6: Once you’ve added the Feedback Genius forwarding address, check your Gmail inbox for a unique forwarding code from Feedback Genius. Note: The request for a verification code must be sent in English. Step 7: Copy that verification code and add it to your Gmail account within the Forwarding and POP/MAP section. Step 8: Within Gmail, click on Filters and Blocked Addresses and create a new filter. Step 9: Copy the email address from your bounced Amazon buyer message (it should be auto-communication@amazon.com) and paste it into the From section of the filter creation page. Step 10: You can also add copy to be filtered in the "Has the words" section for further filtering power. You can include a common phrase from the opted out email like “buyer has opted out of unsolicited messages.” Paste this line in the "Has the words" section. Step 11: Now you can click Create filter with this search. Step 12: Gmail will now ask you what you want to do with the filter, in the next section. Check the box in the middle labeled as Forward it to: and then select the unique blacklist email address you received from Feedback Genius. You may want to also check the "Delete it" box or "Skip the Inbox" to keep the notifications out of your inbox in addition to forwarding. Step 13: Click the Create filter button. 🙌 Your filter has now been created! Whenever you receive a buyer opt-out message, Gmail will forward the address to your Feedback Genius blacklist, so you will no longer send that buyer messages in the future. You will also never send a message to a shopper who was added to the blacklist by someone else in the Feedback Genius community. "How will I know if I've completed this step correctly?" ✅ If I selected for the opt-out emails to "Skip the inbox" or "Delete it" in addition to forwarding to the blacklist, I will no longer see opt-out emails in my Gmail inbox. What is the Global Blacklist?